As a writer/blogger/influencer/whatever you want to classify me as, I get invited to a lot of media events. They’re usually previews of new spaces, products, menus, what have you, and typically other industry people are invited as well. The more events I go to, the more I realize that the people that attend these events like to look their best at all times; makes sense because they’re usually being photographed or taking photos themselves. If I’m being honest, it can be a little intimidating. However, when I take the time to do the same (pamper myself a little), I feel like I can play with the big dogs too. A couple weeks ago I shared with you my morning routine. Naturally, the morning routine sets you up for a successful day. But what about in the evening? How would I get ready for a dinner date, or a media event, or even a GNO? You bet I’ve got a routine for that too! And it usually starts with a soothing and relaxing bubble bath. My current obsession is the Love At First Sight bath bomb from Amore Lee Cosmetics. It smells sweet, kind of like coconuts, and turns the bath water a gorgeous shade of sapphire blue. Taking a bath before an event helps to calm my nerves, which even as an extrovert, I have myself too sometimes. Plus, I get out smelling like a tropical drink which is always good. 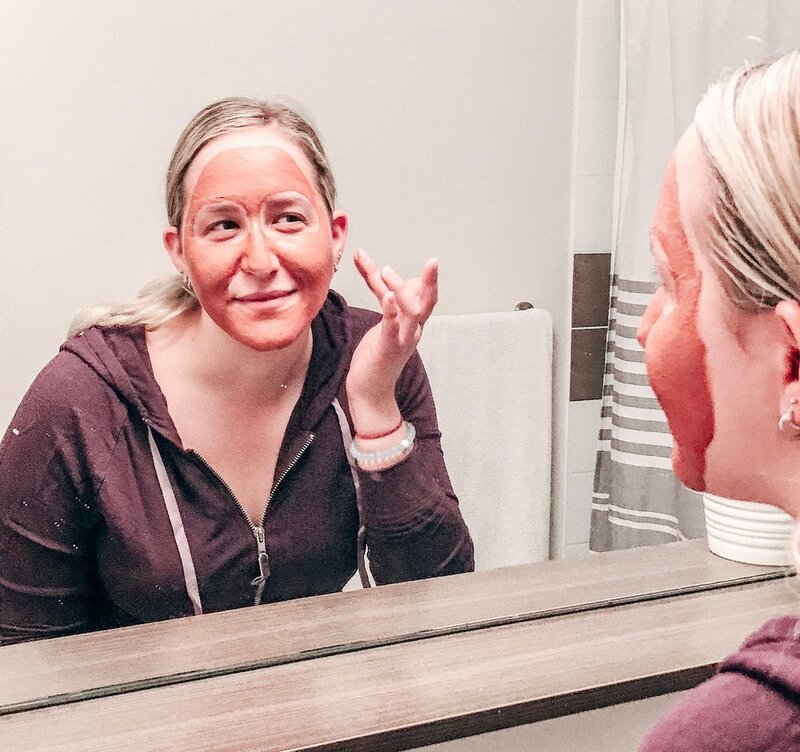 After the bath, I like to apply my favourite face masks depending on what my skin requires that day. Sometimes it’s a hydrating sheet mask, other times it needs a good exfoliation to clean out any products built up from the past few days. The one I’ve been using recently is a Pink Clay Mask that exfoliates and polishes away impurities. I let it sit for 10-20 minutes while picking an outfit to wear (and jamming to my fave songs of the moment, of course). When I wash it away with warm water, I’m left with a squeaky clean face that’s ready for my lotions and potions of the night. Ok, so now we’ve got an outfit picked out and we’re ready for some makeup. I’m sure it’s pretty obvious that I don’t use a ton of makeup because I pride myself on my skincare routine and don’t think I really need it (to each their own). I do, however, still like to look awake and alert when often times I am not. Fake it til’ you make it, am I right? I usually apply my fave eye cream as part of my skincare regime, and that’s got a bit of a highlighting effect to it, so I don’t need concealer. I also won’t leave the house without mascara on because I look like a zombie straight out of The Walking Dead otherwise. On a night out though, I like to show myself a bit of extra love, and use a lip scrub to make my lips extra soft. The Sweet Escape lip scrub (basically a piña colada in a jar), also from Amore Lee, is perfect to slough off dead skin and seal in moisture. I especially like to use this whenever I’m adding lipstick to my look to give it a solid canvas to sit on. A beauty secret that I learned recently is using shimmering body oil to look more flashy in photos. It not only moisturizes and hydrates your skin, but the shimmer is just noticeable enough to take your look up a notch. The natural glow is everything, and using this coconut based body oil will match your body’s radiance to that of your face. Gotta keep it consistent, right? A little goes a long way, and it absorbs relatively quickly, leaving behind a sun-kissed glimmer that is perfect for any Insta photo. My everyday appearance has become increasingly important, especially in the work I’ve chosen to do. My style, my skin, my hair, it all contributes to my over all personal brand. The most important aspect, however, is my confidence. By taking some extra time to treat myself and care for my body before a big night out, I am proving to myself that I can put myself first and achieve whatever it is that I choose to achieve. Always aim to put your best face forward, no matter what you do. It really helps to creates a more positive perspective on life! What do you do to get ready for a night out? Are you a serial face-masker like I am? Cause ya girl has a stack of sheet masks under the sink just waiting to be used. And don’t forget to let me know your event-ready routine in the comments.